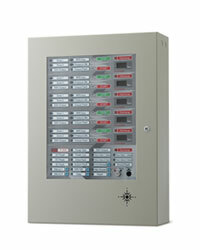 Panel and manual pull station count-down simultaneously. Discharge delay timer setting (20 ~ 999 seconds). Cross-zone detection confirmation makes better stability. Built-in phone jacks on both panel and manual pull station. Expandable to 5 cross-zone detection sections. Each section has manual/auto operation mode. Through dipswitch to select the supervision on feed-back signal of agent discharge. All 24V output contacts are protected by fuse.